Santa Cruz Tourist Information Center in Bolivia. Plaza 24 de Septiembre. The Santa Cruz Tourist Information Center is located inside the Casa de Gobierno on the northern sidewalk of the city's central Plaza (24 de Septiembre) directly next to the Bank of Argentina and Aerolineas Argentinas offices and directly across from the front entrance of the Cathedral. This used to the the palace of the prefecture which has now moved to another location. 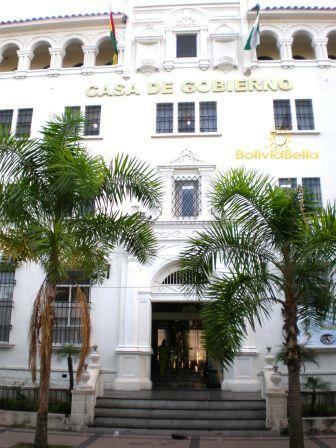 Today this building continues to house departmental government offices and the small tourist information center which contains maps, guidebooks, and brochures of all kinds. You'll see the entrance clearly if you stand in the central plaza and turn your back to the cathedral - this is the entrance: I stopped in to see what services are offered and was warmly greeted by Roxana and Magalí who showed me their office and explained that their current functions simply include orienting tourists to nearby destinations and/or travel agencies for more information. Most of the brochures are provided by tour operators, restaurants and hotels, and are not printed by the departmental government itself. However, there is plenty available (I left with a stack of great brochures) and travel agencies and tourist attractions know to supply the office from time to time. Given its central location, it's an easy walk from most downtown hotels and hostels. It's super easy to find and well worth a short visit just to find out a bit more about all the beautiful tour and travel options available in the department of Santa Cruz. I learned of a few new places myself (so now I'll have to go visit them so I can share about them with you). This building used to house several rooms with a "museum-like" atmosphere and was previously called the "Tourist Interpretation Center" because tourists could enter and take a guided tour through each room and learn about the different cultures, natural attractions, and other tourist attractions in Santa Cruz. Today, these salons have been turned mostly into offices and that's rather sad, but funding just wasn't enough to keep it running. Still, staff are friendly and willing to provide suggestions to ensure your stay in Santa Cruz is as delightful as possible. The Santa Cruz Touris information center is open from Monday to Friday 8:00 am to 7:00 pm and on Saturdays and Sundays from 9:00 am to 12:00 noon and from 3:00 pm to 5:00 pm. Personnel speak a very modest amount of English.